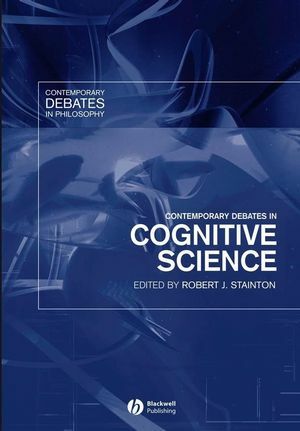 This volume introduces central issues in cognitive science by means of debates on key questions. The debates are written by renowned experts in the field. Addresses topics such as the amount of innate knowledge, bounded rationality and the role of perception in action. Provides valuable overview of the field in a clear and easily comprehensible form. Robert J. Stainton is Associate Professor at the University of Western Ontario. He has published some 40 articles on various topics in linguistics and philosophy, and has authored or edited eight previous books, including Philosophical Perspectives on Language (1996), Knowledge and Mind (2000) and is co-editor of Philosophy and Linguistics (1999). Just How Modular Is The Mind?. 1. The Case for Massively Modular Models of Mind Peter Carruthers. 2. Is the Mind Really Modular? Jesse Prinz. 3. Is the Human Mind Massively Modular? Richard Samuels. How Much Knowledge Of Language Is Innate?. 4. Irrational Nativist Exhuberance Geoff Pullum and Barbara Scholz. 5. The Case for Linguistic Nativism Robert Matthews. 6. On the Innateness of Language James A. McGilvray. Has cognitive science shown that human beings are cognitively bounded, or irrational?. 7. Bounded and Rational Gerd Gigerenzer. 8. Bounded Rationality and the Enlightenment Picture of Cognitive Virtue David Matheson. Are rules and representations necessary to explain systematicity?. 9. Cognition Needs Syntax but not Rules Terrence Horgan and John Tienson. 10. Phenomena and Mechanisms: Putting the Symbolic, Connectionist, and Dynamical Systems Debate in Broader Perspective Bill Bechtel and Adele Abrahamsen. Can consciousness and qualia be reduced?. 11. Consciousness and Qualia Can Be Reduced William Lycan. 12. Consciousness and Qualia Cannot Be Reduced Brie Gertler. Does cognitive science need external content at all?. 13. Locating Meaning in the Mind (Where It Belongs) Ray Jackendoff. 14. The Intentional Inexistence of Language Georges Rey. Is the aim of perception to provide accurate representations?. 15. Is the Aim of Perception to Provide Accurate Representations? Kirk Ludwig. 16. Is the Aim of Perception to Provide Accurate Representations? A Case for the ‘No’ Side Chris Viger. Can mental states, knowledge in particular, be divided into a narrow component and a broad component?. 17. Can Cognition be Factorised into Internal and External Components? Tim Williamson. 18. The Internal and External Components of Cognition Ralph Wedgwood. "This is a remarkable volume. It’s an excellent text for upper division courses, and it also makes important original contributions to research on a number of “hot” topics in cognitive science." Stephen Stich, Rutgers University"
A selection of debates discussing central issues in cognitive science.